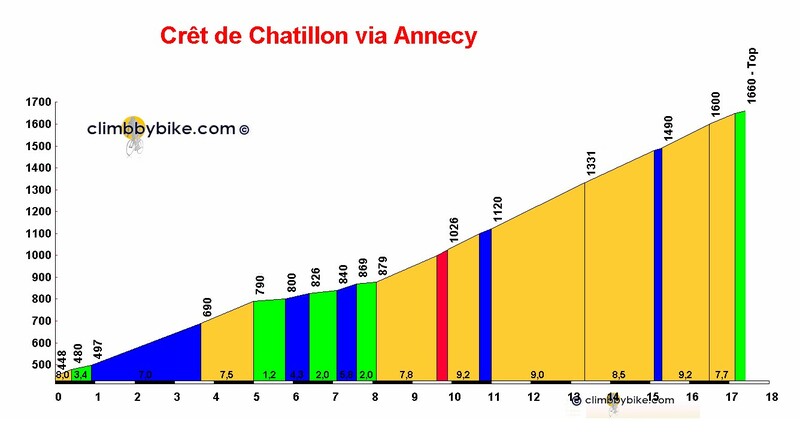 Cycling climbing profile of Semnoz from Annecy. Cycling climbing profile of Semnoz from Annecy. The climb starts almost immediately at the roundabout as you turn off from the D1508 leaving the town to the south. The road rises relentlessly through forest up a series of switchbacks for 5km before 3km of respite. The remaining 9km seem never-ending, with the gradient rarely dropping below 9%. The views over Lake Annecy from the top almost make the suffering worthwhile!